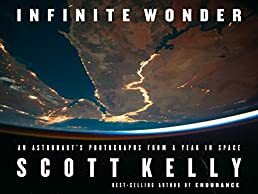 Infinite Wonder: An Astronaut's Photographs from a Year in Space | Your #1 Source for Kindle eBooks from the Amazon Kindle Store! One's perspective shifts when one lives for an entire year–as Commander Scott Kelly, and no other American astronaut in history, has–in the isolating, grueling, and utterly unforgiving vacuum of space. Kelly's photos prove that this perspective–from 250 miles above earth–while hard-won, is also almost unspeakably beautiful. He mastered the rare art of microgravity photography. Using a Nikon D4 with a long 800mm lens and a 1.4x magnifying zoom lens, he panned the camera as the shutter released in order to compensate for the space station's velocity: 17,500 mph relative to the earth. Kelly's artist's eye helped make him a social media sensation, and here his photos are collected alongside his own commentary, which sets the images in their proper contexts, human and cosmic. Kelly captures sunsets, moonrises, the aurora borealis, and the luminous, hazy tapestry of the Milky Way. He presents snapshots of life and work on the International Space Station, from spacewalks to selfies. But above all–or floating amid all–he takes the earth itself as his celestial muse. Here are hurricanes, wrinkled mountains, New York City shining like a galaxy–glorious photographs that are, in themselves, a passionate argument for the preservation of our planet in the face of climate change and environmental destruction.